We spent a beautiful June afternoon here walking through the grounds, viewing the art work and lighting candles for family members. Love it!!! This little church really lends itself to being black and white. I love the way the path draws you through those lovely gates in the adobe wall. I’d like to see the church behind the wall if you have any photos of it. Nice black and white interpretation Lisa. Lisa, I was obsessed with snapping pics of all the quaint little adobe homes and churches while I was in NM. Santa Fe was a magical place for photography! Great shot! I know exactly what you mean! It must be because the adobe is so different from what we are used to and I love the warm colors against the bright blue skies. Happy to know you like this one! The picture is lovely–and B&W really brings out the key features, and highlights them. This is a perfect capture, Lisa. I am so glad I’ve seen it. I know the place has charms on its own, but your take and editing made it into something really special! Thank you Paula for such a nice comment! I love the location but wasn’t happy with my color photos so haven’t posted anything from this day. For some reason I thought about working it in black and white yesterday and am happy I took the chance! We’ll have to find this when we go to NM this year ! Oh yes, make sure you visit! There is a fantastic restaurant close by too in an old hacienda called Rancho de Chimayo. 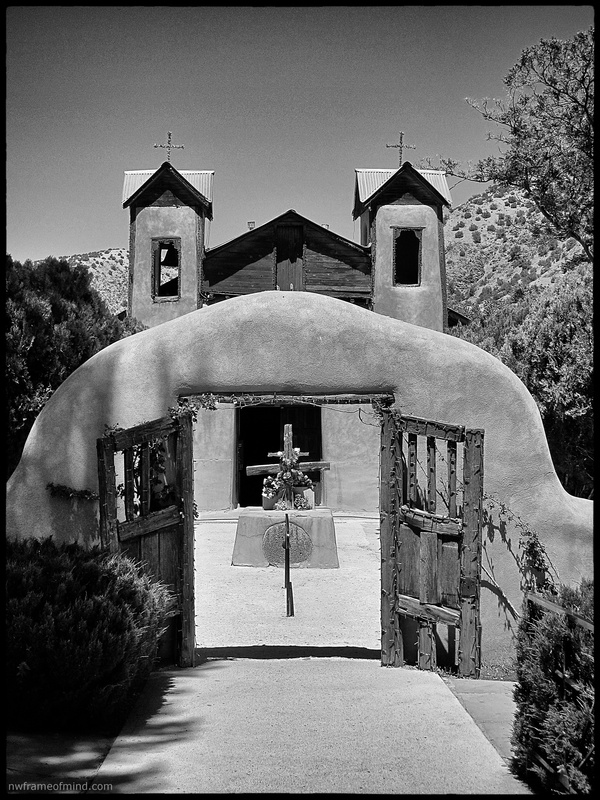 http://ranchodechimayo.com/index.htm . If you get a chance be sure to stop for a meal. I love the food and the home is beautiful. Enjoy your trip! We usually have a big family get together at El Paragua, which I think is in Espana, but we’re always looking for something new. It looks good, we should check it out. B & W are perfection for featuring this charming little charming church. Wow – we were there a few years ago. Isn’t there a nearby chapel with all the little baby shoes. This is wonderful memory of a beautiful area of New Mexico. Thanks Bruce, yes there is a chapel close by filled with baby shoes, photographs and a lot of small personal items as reminders of loved ones… I’m glad we can share memories of this beautiful place.